Here's a fun card I made last week-and actually mailed! Wow!! The focal image is from the new set On the Grow. I decided to try some watercoloring and this was a perfect fit. I actually made two of these (and mailed them both!!). This one is birthday, the other was thinking of you for someone going through a very rough time. 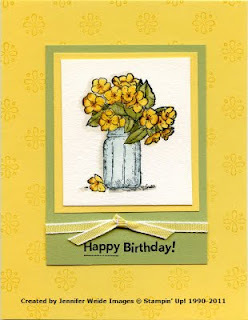 The card base is Daffodil Delight that I stamped with the Pretty Pattern background stamp in Daffodil Delight. The flower image was stamped on watercolor paper in Stazon black and then watercolored. It's been so long I'm having a "blond" moment and not remembering exactly what I used. I'm thinking markers. With the watercolor paper you can color a little and blend alot. The flowers were colored with Daffodil Delight. I then used a blender pen to lighten the centers and then add Peach Parfait. I shaded and outlined flowers with some More Mustard. If anything looks too dark-go over it with your blender pen. The leaves are Pear Pizzazz. I colored them in, then came back a second time and shaded and accented. The jar was done with blue, Bashful maybe?? I outlined the jar inside the black line, then blended the color over the entire jar. I shaded under the jar and along the left edge with Sahara Sand. Not bad huh?? The colored image is layered on Daffodil Delight then onto a larger Pear Pizzazz. I knotted a narrow Daffodil Delight Taffeta ribbon around and stamped the saying at the bottom in Stazon Black.